I recently made the mistake of telling some friends that I never get sick. I can’t remember the last time I got really sick. I’ve gotten a cold here and there, but nothing that has really slowed me down. That is, until a few weeks ago. I got the flu and I got it good. I was sick for two weeks with fever, body aches, extreme fatigue, and coughing. The fever was the worst part because it would not go away. It loved me and decided to stay with me for 12 straight days. It might not have lingered so long, but after Day Five, I assumed I was on the mend and decided to go back to teaching my fitness classes. Big mistake. After two days of teaching, I was toast. The low-grade fever I was beginning to get used to started running higher and I became so exhausted I could barely function. The doctor ordered me to stay in bed for five days to let my body recover and heal. Normally, the thought of five days of bed rest would’ve sent me into orbit, but I was so tired that it was a welcomed relief. A few excellent articles on WebMD state that most medical experts agree that working out with a cold may not be a big deal, but when fever is involved, exercise should be off limits. 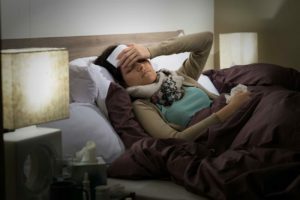 Dr. Lewis G. Maharam, a New York City-based sports medicine expert said, “The danger is exercising and raising your body temperature internally if you already have a fever, because that can make you even sicker.” Um, yes, I can attest to that. Another way to assess if you should workout is to do a “neck check.” Dr. Neil Schachter, medical director of respiratory care at Mount Sinai Medical Center in New York said, “If your symptoms are above the neck, including a sore throat, nasal congestion, sneezing and tearing eyes, then it’s OK to exercise. If your symptoms are below the neck, such as coughing, body aches, fever and fatigue, then it’s time to hang up the running shoes until these symptoms subside.” Agreed, Doc. So, how do you stay fit when you’re sick? Basically, you don’t worry about it. If you’re really sick, you should focus on getting healthy again. If you’ve been working out regularly, relax. Muscle memory is your friend. Your body has created a physiological blueprint of how to do what you’ve been doing. 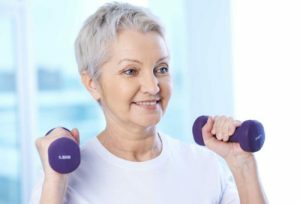 “Muscle memory stems from your body’s learning not just how to perform a task, but also how to break down muscle tissue and then repair and rebuild it,” explained William Kraemer, Ph.D., a professor in the department of kinesiology at the University of Connecticut at Storrs. “That physiological knowledge lets you come back from injury, surgery, and even pregnancy faster, easier, and often better than before,” he said.